Collection of useful helper functions and objects for Python. mxTools™ is a Python extension package that includes a collection of handy functions and objects giving additional functionality to the Python programmer in form of new builtins, extensions to the sys module and several other helpers as part of the package. Provides fast C implementations for most helpers. Stable, robust and portable (mxTools has been around for almost 10 years now). mxTools is written in a very portable way and works on pretty much all platforms where you can compile Python. 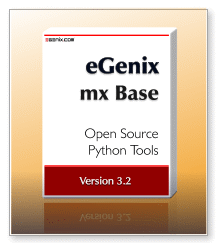 mxTools is provided as part of the eGenix.com mx Base Distribution. Please see the mx Base Distribution page for details regarding the license. The PDF file is also available as part of the installation and can be found in the mx/Tools/Doc/ folder. mxTools is provided as part of the eGenix.com mx Base Distribution. Please see the mx Base Distribution page for downloads and installation instructions. eGenix has used mxTools a lot for internal and client projects. It is often handy to have a set of functions around that can easily be extended to meet our specific needs.